The 2019 Maruti Suzuki Wagon R is finally here but is it competitively priced compared to its rivals? Find out here. We are only comparing the 2019 WagonR with only the petrol variant of other models. The third generation Maruti Suzuki Wagon R finally made its debut this week and certainly looks like a blockbuster offering with its slew of changes over the predecessor. Priced at ₹ 4.19 lakh (ex-showroom, Delhi), the Wagon R is pricier than the older version but also justifies its additional price tag with a new platform, larger proportions, roomier cabin and a host of new features. The tallboy stance has been retained and so is the design language. But in a segment that has some hotly contested offerings, how does the new Wagon R compete against its rivals? 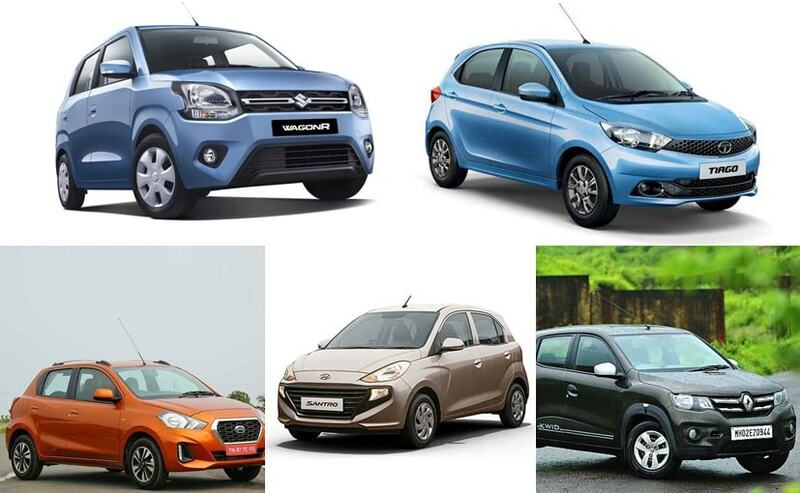 We compare the all-new Maruti Suzuki Wagon R against the Hyundai Santro, Tata Tiago, Datsun GO and the Renault Kwid to see how competitively is the blue-eyed car is priced. Considering the 2019 Maruti Suzuki Wagon R is available only with petrol engines, we'll be taking the petrol version prices into consideration. Prices for the Wagon R start at ₹ 4.19 lakh for the base version, but the Hyundai Santro is more competitively priced starting at ₹ 3.90 lakh. The Tata Tiago and the Renault Kwid base variants are priced at ₹ 4.04 lakh respectively. The Datsun GO though becomes the most affordable offering here with prices starting at ₹ 3.29 lakh. It's interesting to note that a lot of equipment is also offered as standard on the GO including dual front airbags, ABS with EBD and Brake Assist. For the mid variants, the new Maruti Suzuki Wagon R is priced at ₹ 4.69 lakh that goes up to ₹ 5.36 lakh depending on the engine variant you choose. The new Wagon R is available in two engines this time with the 1.0-litre three-pot motor, and the new 1.2-litre four-cylinder petrol engine. In comparison, the Tiago mid-variants are priced between ₹ 4.35-5.11 lakh which makes it slightly more competitively priced over the Hyundai Santro that is priced between ₹ 4.25-5.47 lakh. The Datsun GO gets the more competitive pricing between ₹ 4.14-4.64 lakh. The Renault Kwid 1.0 is offered in a single trim and you get the Climber version in the top-spec trim. For those looking at the top-of-the-line variants, the 2019 Maruti Suzuki Wagon R is priced at ₹ 5.69 lakh, which makes it considerably more expensive than the competition. The Hyundai Santro remains more competitively priced at ₹ 5.46 lakh, while the Renault Kwid Climber edition is priced at ₹ 4.33 lakh. The top-spec Datsun GO is the cheapest at ₹ 4.89 lakh, while the Tata Tiago is priced at ₹ 5.57 lakh (all prices, ex-showroom Delhi). While the Datsun GO certainly has the advantage in terms of pricing, both the Hyundai Santro and the Tata Tiago are competitively priced albeit on the expensive side. The new Wagon R turns out to be slightly expensive but offers additional features including the 7-inch touchscreen infotainment system with Apple CarPlay and Android Auto compatibility, LED daytime running lights and more. The Wagon R though does miss out on alloy wheels even on the top-level trim.